When the peaceful Xeneron needs firepower this heavy flying gunship is called in to expel invaders from their beautiful Blue Star System. 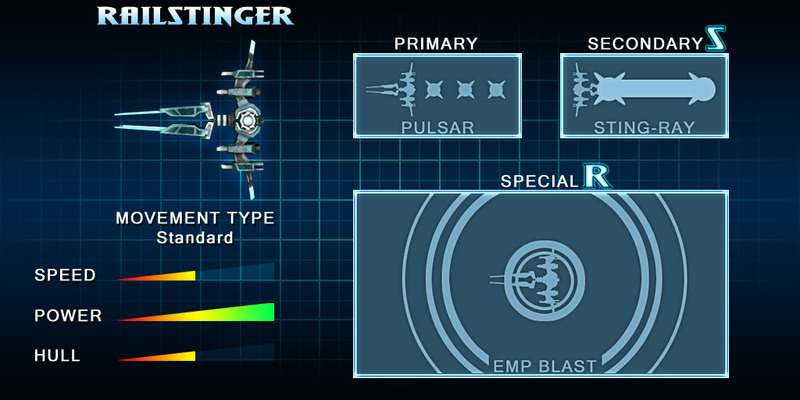 A threat from the front and the rear, the RAILSTINGER is capable of mass destruction forwards and backwards seamlessly. When in Overdrive it's quad pulsar bursts can cut through multiple enemies at once and the rear Sting-Ray beam takes care of both chasing and circling threats in the hands of experienced pilots. What this ships lacks in speed, it makes up for in sheer KPS (kill-per-second) opportunity and visceral fire power.